Pocket pH tester for field measurements. The Pinnacle Chek-Mite pH-25 pH Testers provide a whole new level of performance in an inexpensive line of pocket pH testing instrumentation. Featuring advanced microprocessor technology, Chek-Mite pH Testers offer automatic calibration (to values of 4, 7, or 10.01). Sealed components and casing are waterproof, and enable the pH Testers to float when dropped in water. The pH-25 pH Testers offer a BNC electrode connector which allows several different pH tester electrode options. The Pinnacle Chek-Mite pH-25 pH Testers provide pH measurement with automatic calibration and auto or manual sample end-point determination. This line of pH Testers comes with a six-month warranty. pH tester electrode not included. Ideal for aqueous samples; low maintenance. This tris compatible pH electrode has a flat surface for gels and other semi-solid samples. It is also ideal for small samples. 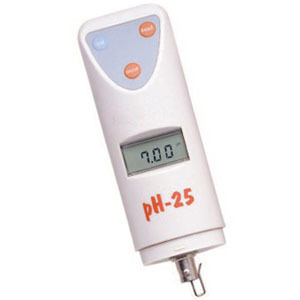 This pH tester electrode is refillable and tris compatible. 6 125mL bottles of 3M KCl solution.